I want to thank National Societies and States for electing me to the Standing Commission at the 32nd International Conference of the Red Cross and Red Crescent in 2015. During the last two years serving as vice-chair alongside Chair Eva von Oelreich in the Standing Commission, my belief was reaffirmed that it can play a role in strengthening the Movement capacity to operate in a fast-changing and increasing challenging environment. Its think tank role can provide input to the Movement-wide reflection process. I thank my fellow members in the Standing Commission for electing me the Commission chair in September 2017, following the regrettable resignation of Ms von Oelreich from the Commission owing to personal reasons a month earlier. I am humbled to preside over the Commission, a lean organ filled with highly experienced and competent members. I would like to congratulate Chrystold Chetty on his election as vice-chair, and welcome Ibrahim Osman into the Commission. Together with the Commission members, I hope to build on Ms von Oelreich’s legacy in optimizing the full potential of the Standing Commission in fulfilling its roles and responsibilities. This can only be done in an atmosphere of open, and honest discussion and dialogue which I intend to reinforce, especially with National Societies, the most important building block of the Movement. I therefore encourage you not to hesitate to contact me or the Standing Commission Secretariat for any issues you wish to bring to the Commission’s attention. I also look forward to working with States which have been a privileged partner with the Movement. 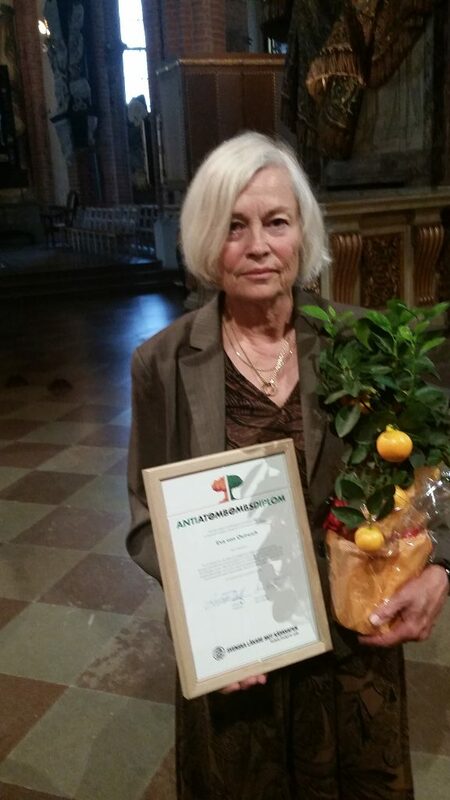 It is an Anti-Nuclear Bomb Diploma awarded by Swedish Physicians against Nuclear Weapons. To me, it’s a recognition which is mindful of all the work the entire Red Cross and Red Crescent Movement has done ever since an ICRC delegate, after the 1945-disaster in Hiroshima on 6 August 1945 and in Nagasaki on 9 August, reported to the Head Office in Geneva about the unimaginable disaster and the devastating human suffering. I feel deeply honored to receive this recognition. I receive it well aware that I, as President of Swedish Red Cross in the past, and today as Chair of The Standing Commission–the trustee of the International Conference of the Red Cross and Red Crescent which is the highest deliberative body of the Movement between our international conferences, meeting every four years–often represented the core values of our Movement in discussions about the catastrophic humanitarian consequences of nuclear weapons. Why are you so committed to the fight against nuclear weapons? We have lived with nuclear weapons for over 70 years. We have not destroyed them, so they can still destroy us. As long as nuclear weapons exist there is a risk that they are used–intentionally or unintentionally. And if they are used, we know there is a lack of capacity and resources, nationally and internationally, to provide effective assistance after a nuclear attack. The world cannot handle these consequences. We are challenging fate and can only lose. How can the Red Cross contribute to the abolition of nuclear weapons? The Red Cross Red Crescent Movement is central to the development and application of the Geneva Conventions which govern how wars must be fought, since we still have wars, and must protect civilians and make sure indiscriminate damage is not inflicted. The humanitarian logic contained in International Humanitarian Law can be used to look at the humanitarian consequences of nuclear weapons, also in discussions with the countries of the world during the International Conferences that I mentioned earlier. Is it even possible to abolish nuclear weapons? There are those who consider it naive to think that states can and even should abolish nuclear weapons. Others consider it naive to think that we can have nuclear weapons in the world without taking senseless risks to humanity. A lot that was impossible earlier is possible today. We had death penalty in Sweden until 1921, but it was possible to remove that. We must prohibit nuclear weapons. Today we often talk about the risk of these devastating weapons in the wrong hands. The question is whether any hands are right when associated with the devastating humanitarian consequences of nuclear weapons. One thing I know. It takes many individuals and many organizations to act together for humanity’s vital issues. No matter how naive some states think the questions may seem. And if it is naive to think that we can eradicate nuclear weapons to protect humanity, I am happy to be naive. The Council of Delegates and the International Conference are behind us. You have done tremendous work and advanced the humanitarian cause on many levels. I also want to thank National Societies and States Parties to the Geneva Conventions for the confidence in me they have shown by electing me to the Standing Commission. At the first, constituent, meeting of the Commission, my fellow members chose to elect me as their Chairman, to use the terminology of the Statutes. For reasons you may understand, I would prefer “Chair”. Steve Carr, who was the Vice Chairman. His unceasing efforts to modernise the International Conference and Council of Delegates paid off. We must all thank him for his contribution to a more effective and efficient Conference, and one which provided a programme of events that was more inclusive, more open and more accessible than ever before. Pär Stenbäck, whose many years of experience, from his National Society, the International Federation, his government and intergovernmental organisations, helped the Commission develop its thinking and, not least, its role in relation to the MoU. Mohammed Al-Hadid, whose wisdom, experience, and courage enabled the Commission to deal constructively and successfully with some of the most intractable problems confronting the international community. The results of his efforts demonstrate that the Movement, when acting as one, can achieve more than governments can on do their own. Assuming my new role, I will continue to pursue the “agenda” I announced as part of my candidacy. I wish to contribute to sharpening the International Conference of the Red Cross and Crescent as a forum for debate and decisions on humanitarian issues confronting the international community. The basis is action on the ground, which is the role of National Societies supported by the International Federation, the ICRC and Sister Societies. We need to carry on strengthening the dialogue and interaction with the States Parties to the Geneva Conventions, as well as humanitarian actors outside the Red Cross and Red Crescent Movement. This means safeguarding the individual and complementary mandates and independence of each component of the Movement, yet supporting one another to maintain a harmonious and effective Movement. By building and keeping trust, we will remain that prime convener which brings understanding of humanitarian action. We have many different roles to play and I am ready to play mine. I will do so with fellow members of the Standing Commission, but I will also do my best to reach out to others. Democracy is about choice. I will reach out to those who were not elected to the Commission this time. In their various ways, their experience, knowledge, integrity and youth, is an asset that we cannot afford to do without. Thank you, again, for your confidence. I already look forward to meeting you in Istanbul in 2017.